Carve. What does it mean? I mean seriously, what can be said for this word. It is just a word, right? Words change meanings, develop new character. They evolve. So let’s look at this word more closely. Where did it come from? Carve is a verb in the Old English language which originally was coerfan meaning to cut or carve. Nothing much has changed there. If you look it up in any search engine, it says that it is related to the Dutch kerven, which doesn’t seem like that would be too unlikely considering that both are Germanic languages. 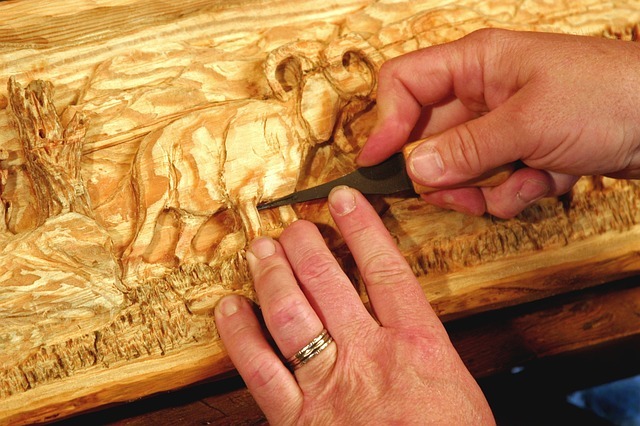 If you are woodcarver or an artist, you would likely use the word carve for some of your work. A woodcarver can carve works of art out of wood. Or maybe even a cane for someone to use when walking. An artist can carve statues and intricate little pieces made out of ice. Consequently, it maintains its original meaning. Now, I know nothing about skiing. Nevertheless, I saw that the word carve is used within that sport. It is the use of one’s skis by tilting them on their edges and using one’s weight to create an arc as per Bing. I assume they are speaking of snow, although it could be water. All I can say is, “Wow!” I would classify that as a small change in character. Finally, carve is being used today to carve (out) one’s future. That means to make our way in the world, to find our place, to forge our way. I believe most of us are trying to carve out our future, to make a mark in this world in our own way. Carve has pretty much maintained its original meaning, although it has picked up a little bit of nuance here and there. It is basically the same word which has a place in most of our lives. It has carved its mark in this world, wouldn’t you say? Great article. I learned something today. Thanks for sharing. Thanks Tikal! I really appreciate your feedback since I am new at this. 😀. Your comment is really appreciated.